Adding an air of romance to proceedings, the Crazy Stupid Love hitmaker stood among a path of scarlet petals earlier in the day. Cheryl looked incredible in the intimate snap, wearing leather trousers with a white blazer slung over her shoulders and zig-zag mesh heels. 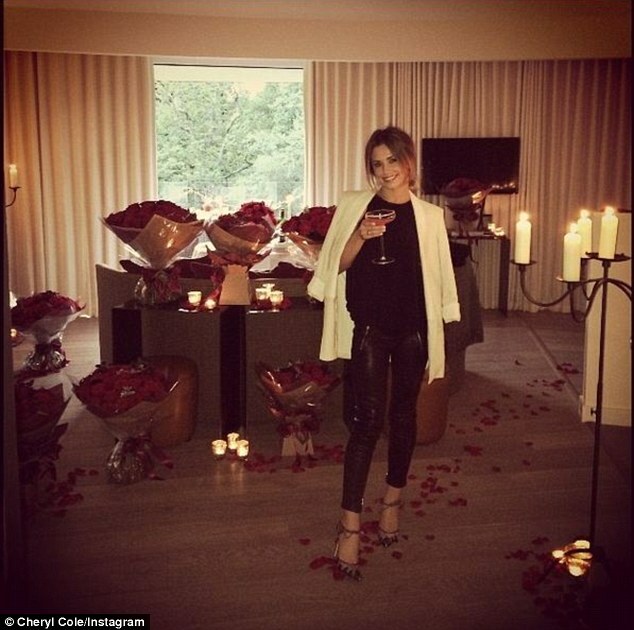 While it's unclear who bought Cheryl the floral arrangements, The Daily Star reports that Cheryl's French lover, Jean-Bernard Fernandez-Versini is planning a special day for her. Reports say the restaurant owner is hoping to reserve hit nightspot Chiltern Firehouse for her party and his own company, Cosy Box, will do the catering. A source told the paper: 'Cheryl knows there's going to be a party, but doesn't know all the details yet. Cheryl has a busy summer ahead of her as she has returned to the X Factor judging panel this year, where she joins Simon Cowell, Mel B and Louis Walsh. On Thursday, Chezza took Simon to her favourite chinese takeaway in Newcastle for some dinner after the auditions.